Order within 12 hours 23 minutes and it Ships Today! 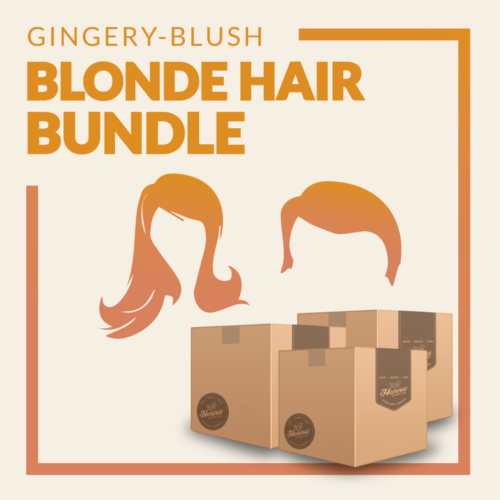 A feisty blonde hair booster, this subtle pigment blend warms blondes to a golden-ginger blush, while adding all the nourishing benefits of a traditional henna-herbal treatment. The final color is a dazzling, gingery, strawberry blonde. Vibrant warm color-booster to all blondes. Subtle warmth to light brunettes. *Mixes well with Pure Henna for even more strawberry notes. NOTE: This color will not lighten dark hair—zero harsh bleaching agents. Best for light hair colors only. Our Henna-Based Hair Dyes Are Your Best Choice: Award-winning herbs are freshly harvested, milled, & sealed—remain rich & potent. Botanicals nourish longer. Pigments saturate deeper. NOTE: This color will not show on darker hair colors. It will not lighten dark hair—zero harsh bleaching agents. Blonde to very light brown hair will achieve best results. Safe to apply over previously bleached or lightened hair (always strand test prior). *mixes well with Pure Henna too. • people with blonde to light brown hair or completely gray/white hair. • someone looking to warm up their blonde hair or someone with light brown hair looking for subtle golden-ginger undertones. *Note: Will have little effect (possibly slight golden, gingery tints) on African, Indian, and Asian hair (unless natural color is very light). 1 packet (3.5 oz/100g) will dye hair to shoulder. 3 packets (10.5 oz/300g) will dye hair to waist. Note: hair thickness and type (straight, curly, etc) will make a difference. For super thick curly hair, order an extra packet. Ex: Super Thick Curly Hair to Shoulder, Order 2 Packets. From hard water to daily pollution to styling products, blonde hair needs a boost to get back its luster and unique hue. This safe transition warms up cool blondes (blue/green undertones) a couple notches to a golden-ginger blush, while adding all the nourishing benefits of a traditional henna-herbal treatment. Assisted by the mild gold of cassia obovata, Henna sets the base for the color. The henna-reds are tempered by the vibrant turmeric yellows & subtle cassia golds. They battle for pigment absorption and settle to a smashing fusion of all three shades: gold, yellow, & red. The final color is a dazzling, gingery, strawberry blonde. Vibrant warm color-booster to all blondes. Subtle warmth to light brunettes. • Organically grown & seasonally hand-harvested in indigenous hearty soils. • Milled to a fine powder to allow maximum, predictable pigment release. • Hand-sifted three times to a uniform texture for best application. • Vacuum-sealed & light-sealed to preserve potency, purity, and freshness. NO added chemicals, preservatives or perfumes—just pure natural goodness! Ingredients: cassia obovata, lawsonia inermis linn (natural henna), turmeric leaf extract powder…(that’s it). Cassia obovata, lawsonia inermis linn (natural henna), turmeric leaf extract powder. Use quart size mixing bowl per full packet (3.5 oz/100 g) and a spoon to mix. Pour powder into bowl. One packet colors/treats straight, shoulder length hair. Add hot tap water (approx 120º F) gradually to the powder. Add little water at a time to get an applicable paste consistency. (thick pudding or cake batter). From scalp and root of hair, work evenly to top of hair. Try for complete, even coverage. Methodically apply from back to front section. Take your time. Massage well into hair. Work all hennaed hair into a mound on top of head. Touch-up along all hair lines. When done, cover head with included plastic cap. Leave on for one to two hours. Note: Treatments peak after one hour. Colors deepen up to two hours. Rinse out thoroughly (no shampoo) until all product removed. Then use conditioner. Note: Paste rinse-out may take a little time. Conditioner will help removal of dried paste. Blow dry hair for 10-15 minutes to accelerate natural color-changing process. Remember: It’s 100% natural. No added perfumes. Earthy scent will fade after rinsing. Avoid shampooing for 24 hours. Avoid leave-in oil-based conditioners for first week. Henna-based dyes will take up to 48 hours to express true colors and undertones. Undertones can range from light red to green to blue before fully maturing—very normal (most blend within hours). You can reapply as often as you like. It’s all natural, safe, and gentle to hair, scalp, and skin. For more application instructions, how to spot test, and gray root process go to our detailed application page. I love this product!!!! I have naturally golden red hair, and over the years, I noticed it was starting to fade. This product brought my hair back to its original color with a healthy, soft texture! I will never go back to hair salons which use harsh chemicals that leave my hair damage and very unnatural looking!!!! I was very hesitant to try henna but I am trying to reduce the toxic chemicals I use. After spending hours searching through the internet I found Henna Color Lab. The golden blonde color is so close to my natural color that it gave me the courage to give it a try. I ordered the kit that included a treatment product, then wait 7 days and apply the henna color. The first couple of days my hair was a bit on the orange side, but still very attractive. Today is Day 4 and I washed my hair and the color is perfect! It is so shiny and healthy feeling. I’ve received numerous compliments. The color is the exact color if the model shown for this product which is exactly what I was looking for. If you are on the fence, give it a try! I love this product and this color! I love how this color turned out! I have dark blonde hair with a little bit of red in it, and it turned out really nicely. The application was a little messy, but still infinitely easier than chemical dyes. And it smells tons better – I think it smells kinda like matcha powder. The ONLY complaint I have is that the gloves it came with were horrible, but everything else was great! This color did exactly what I hoped. It turned my dull, ashy blonde hair into a subtle strawberry blonde that glows in the sunshine! I love it! I can’t wait to do it again and deepen the color, or maybe try something darker like the copper brown this winter. My hair is a light/medium brown with about 25% gray and this worked like a charm!!! Looks like I have natural gingery blonde highlights and my hair is soft and shiny after application. Another thing I love about this coloring is that since I have short hair I can just mix what I need and then save the rest for the next time. BRILLIANT!!!!! Did not have trouble applying or rinsing this out. I love this stuff! My hair is graying way too fast so I started coloring it a few years ago. I absolutely hated to color my hair – I have sensitive skin & the chemical hair colors would itch & burn my scalp the entire time. My hair does not take color well either so I would end up with patchy uneven color & the stubborn grays were still visible. I just tried the Ginger Blonde Henna Color Lab hair color & I can’t say enough good things about it. It smells so much better than the nasty chemical color. It smells like green tea to me – but is not too strong & most of the smell goes away once you rinse it off. It is a little messy, but I think it is less messy than the chemical color. I left it on for two hours & it did not irritate my skin at all. My light brown hair (with lots of gray) turned out beautiful. It covered 100% of my gray hair turning them into golden ginger blonde highlights. My hair is so soft & smooth now too. I will definitely be using this again! Everyone should try this – it is amazing! I have naturally blonde / champagne colored hair. I had subtle blonde highlights added about six months before I started using the Ginger Blonde henna from this site on my hair. I did a test strand and found that the Ginger Blonde dye had very little effect if I just leave it on two hours. So I put it on at night, slept with it on, and took it off after more than eight hours. I found that my first application was a very delightful change for me to strawberry blonde — my family could definitely tell the difference, but in some lighting strangers thought I was still blonde. The second application made it richer but still subtle. My third time I added 2Tbs of pure henna and it is a lot more red. I have loved the change with each application. And the customer service has been phenomenal. Sally has been great at answering my very specific questions. I feel very supported in my hair adventures here. I am beyond pleased with this product! It had the exact warming effect that I hoped for. I’ve had dreadlocks for almost 2 years now and I was very reluctant to chemically dying them so I just held off, even though while I had my regular hair I dyed it constantly. With the henna dye i knew my dreadies would be safe 🙂 However, I did have to leave it on for a little more than 6 hours! BIG THANKS to everyone at Henna Color Lab for creating a natural and cruelty free product for all of us dread-headed peoples to enjoy. I. Have been using their products for years and I think they’re great! BUT I noticed that the green undertones come out when I use the Ginger Blonde during the summer, probably because Of the sun exposure. It doesn’t come out, I just have to grow my hair out (and keep using the henna dye when it fades and the green undertones comes out). I’ve since switched to the copper brown henna dye which I love! So I bought the starter bundle which included the treatment, shampoo, and then I chose this and the light brown colors. My hair is medium brown with roughly 25% gray. I’ve been coloring my hair every 4-6 weeks for…a really long time. The last few times I chose semi-permanent, but ultimately my hair still gets very dried out. I wanted to go chemical free. I did the hair treatment first, and I liked it…didn’t love it. I struggled to get it all out of my hair, and then I unknowingly used an oil based conditioner to get it out. Conditioned 2 times as directed, and while all the chunks were out, my hair was pretty stiff until I washed it 2 days later. That being said, as this was my first time with henna, it was an excellent practice run for the real color. I learned 2 things…get your own gloves, and use a brush vs. just your hands. My hair is at and just passing my shoulder, and the full pouch of treatment was way too much. Today I did my first real color. I used 1/2 of the Ginger Blonde packet and 1/4 of the Light Brown. I used a paint brush (literally because I realized last minute I didn’t have a color brush), and I used a fork to mix the power to help get the lumps out. I left it on for 2 hours, and did not do the gray roots recommended thing for lack of additional time. It turned out really well! Minimal mess with the paint brush, very natural warm looking color. My highest concentration of gray is right up front at my temple, and the hairs are very fine and light. You can tell the babiest of hairs didn’t quite grab all of the color, but most of my gray has a nice warm blonde to it that blends nicely with the not gray hair. Patience is the key to rinsing, nice and slow, and gentle massage releases all of the crusty bits around the edges. You really do have to take your time rinsing. I used a different conditioner and only did it once, and my hair feels pretty amazing…not weighted down like when you do a box color and use their conditioner. The true test will be to see how the color holds up, but so far, I’m a convert. I’m so happy with my results! I was extremely nervous to try henna but as a natural redhead I needed to cover the little bit of gray starting to come in around my hair line and temples but I didn’t want to not have red hair. It really brightened up my natural color and covered the gray. It looks so good. Note for first timers: it really is as messy as they say. It didn’t bother me but it could be overwhelming the first time you do this. The smell is very “earthy” but again that doesn’t bother me. I would rather have this scent for a day or 2 then the chemical smell and process of highlights. My only dissapointment I had was I had emailed this company a question before I ordered and they never answered me. I had read reviews on how great the customer service was but not in my experience. I decided to order anyway and the henna came very fast and I am glad I ordered and plan to order again. Excellent results!! I mixed the Light Brown and Ginger Blonde. Its shiny and healthy looking. I will never bleach my hair again! Great product! I have used other henna dyes and this is much better. The smell is not as strong and I don’t have to keep on my hair as long. (If the smell still bothers you add a little cinnamon. It doesn’t affect the color and improves the smell a bit.) I have medium blonde hair with reddish undertones so the Ginger Blonde is perfect. It looks natural and does a good job covering my gray hair. I will be using this product for quite a while. I’ve always been hesitant to dye my hair. I’m a strawberry blonde but as a lot of white has been appearing in my hair as the years are passing I have noticed my ends are much darker than my roots. I was using Ginger Blonde to try to restore my natural colour. I got exactly what I was hoping for. I love that my natural high and low lights were retained but with an added boost, unlike the typical all over at home colour which ends up one uniform colour. This looks so natural and suits me very well. I can’t wait to add a couple of tablespoons of Natural Henna to my next application to deepen the reds. I wanted to wait until I had used this product a few times and I’m glad I did. I use a mix of half ginger blonde, half pure henna and the results are fantastic. My hair is noticeably thicker and the most beautiful shade of red. You cant find this color in a box or a salon. The first time I did it I kept it on for 2 hours and it was a very bright orange but I expected this, I’ve seen a friend use henna before and knew it takes up to 2 days to completely settle. I now keep it on for about 4 hours and since the color just builds on itself it gets more beautiful every time I use it. Seriously, my hair looks like a fiery sunset now! I’ve used the neutral henna before and when I found this website, I figured what the heck, why not? SO GLAD I DID! I’ll never use anything else. I am quite happy with my ginger blonde color, it is very close to my natural color before fading and grey/white hairs started showing up. My hubby used the light brown on his pure white beard and it looks amazing-came out golden brown with a hint of ginger in the sunlight. We are both super happy we found these products and have placed another order! On a side note, I did not like the shampoo trial, left my hair feeling sticky and a tangled mess. My hubby however loves the lemon shampoo for his beard and requested more, he loves the scent which is amazing as he has quite a scent sensitivity! I have light brown hair that I love, so it saddened me when some gray hairs started to desaturate my color. With this, I was able to hide the grays and give my hair a nice coppery sheen! Very subtle, and I love it. This is the first time I’ve dyed my hair because of how much I love my hair color and with this, I don’t feel like I’ve changed it, but returned it to how I remember it was before. I just used the Ginger blonde and this was my first time using henna. I am soooo happy with the results. I have dark blonde/light brown hair and I was afraid it would be too subtle. Instead, it is the perfect amount of strawberry blonde without being too yellow or too red. It is so natural and though I do not have many grey hairs, the ones I have around the crown of my head are totally covered and look like highlights. My hair is shiny and looks sooo healthy and less frizzy. I can’t believe people complain about the smell. It just smells like green powder you would put in a healthy smoothy. I used 1 1/2 packets to cover my thick straight hair which is two to three inches below shoulder. I already purchased more for the next time. In love with this color!!!! This is working out for me! I’m a natural redhead who is going blonde too soon. I’ve been looking for something natural to boost my red and cover the blonde and this hits the mark. Plus, it doesn’t damage my hair. I tried all other options and none look as natural. I usually apply it once a month to avoid having to do any root applications. It kind of fades gently so there isn’t a “line” which is great. The only issue I have with henna (any henna) is that its really bright for a couple days then gets normal. Small price to pay to healthy hair dye! This was my first experience using henna. As much as I love blonde highlights, I was tired of chemicals, skin burns, and breakage. I searched extensively for a Ginger-Blonde color, and Henna Color Lab was the only company I found who produces this color. I am THRILLED with the results of this product. In fact, I have just placed an order for the “Valentine’s Special” package. This time, I have also ordered Pure Henna that I am going to mix with the Ginger-Blonde to get even more strawberry color in my hair. Just a personal preference to get a hint more red; I cannot wait to give it a try. How amazing that I can put this color on my hair at any time, as it doesn’t cause damage. My hair is super soft after coloring, no burning on my scalp, and just a slight “earthy” odor left behind. This is the first time I’ve ever colored my hair and the condition is better afterwards! I also have SHINE in my hair – I can toss all the icky silicone based hair products I’ve been using to try to produce the same shine. Oh, and my order shipped the same day that I placed it online! Talk about fast service. You have a life-long customer! This is the best henna product I have ever used. I left it on for a little over an hour and my hair which is naturally medium/champagne blonde turned into a flawless shade of strawberry blonde. I will be using this stuff again and again. The quality of the powder felt amazing, too. This stuff is the best, hands down. I am in love!!! With age my red has turned brown and now some gray. It was time to do something. I am so happy with how my color turned out. I have some of my childhood red back and I love it! Thank you Henna Color Lab!!! I tried henna over a decade ago and hated it. But this henna is wonderful. Just did it today so we’ll see what the colour turns into but so far I love it. I’m a natural ginger/strawberry blonde but accidentally blonded myself with some crappy box dye and wanted my strawberry back so I went with this. It was easy to mix up and apply..the gloves sucked so I used my own. The long processing time took a big chunk out of my day, it was very hard to rinse out, and I smell weird now…but the colour looks great! And I love that it’s all natural. My hair actually feels thicker and healthier now. I bought two packs because my hair is quite long, but it’s fine so I only needed one. The application was messy, but easy to clean up. I started with a clarifying shampoo, which I recommend you use as it may make the color stick better. I have fairly thick hair, so I made sure to really rub it in and I suggest that you do that as well if you buy this product. Take your time if you don’t want random pieces that didn’t get dyed. It is hard to get out. If you don’t have good water pressure I could easily see it being an overall frustrating experience. I rinsed as much as I could out before applying and massaging in conditioner, which really helped loosen up and remove the henna. The color really developed over night. It went from barely noticeable to an obvious change in the morning. When I did a few test strands a week or so ago I noticed that it was brightest on the third day, but seemed to almost completely fade away on the 4-5th day. I had washed my hair with shampoo the day after I dyed it though, so I definitely won’t do that to my hair this time and I’m hoping for a better outcome. My hair is shiny and softer than I expected as of right now, and I really love the color even though it’s not exactly what I wanted- or what the example showed for my hair color. I’d recommend this product to anyone who wants I nice ginger tint to their dirty blonde hair, but if your hair is any darker I highly doubt you’ll see any changes after using this. I just used the product on my medium blonde hair, and I absolutely love the results!!! Wanted to get a strawberry blonde look, and it turned out in just an hour and a half. I also have short, chin length hair, so will definitely get another application out of the one bag. Looking forward to using again for a longer application time to get the full red headed effect. So excited to have found this product!!! !